Last week, I was at Office Depot to pickup some supplies when I noticed a great deal. An Epson printer that I was eyeing last year was sitting on the clearance rack and had dropped in price to a very tempting level. My current 4-year-old HP printer was starting to get a little flaky, burned though lots of ink and didn’t have the wireless printing feature that I wanted. After a bit of research, I decided to upgrade. The Artisan 810 is a multi-function printer that sits at the top of the consumer line. It’s last year’s model and basically seems identical to this year’s Artisan 835. Reviews indicate that its has great photo printing, which as a photographer, was one of my key features. It also works well for everyday needs and between the built-in scanner, duplexer, auto-sheet feeder and fax it has more than its share of bells and whistles. I haven’t tried all of these features but wanted to give a quick review of its print quality. As a photographer, I’ve heard mixed and conflicting information about ink jet printers. Ken Rockwell, that runs a popular photo website stated that inkjets are dead. I’ve asked professional photographers, that have high-end printers. Which makes better prints, ink jets or minlabs using a traditional chemical photographic process? They said, while ink jets were really good, they thought the traditional prints were still better. Yet I find that there are serious photo websites that do their special art prints on ink jets. For these reasons, I was not expecting much from my new Epson. My own experience using the four-year old, admittedly lower end, HP printer only reinforced my doubts about the ink jet printers. Well all of my perceptions changed when I saw the photo output of this new Epson Artisan 810. The results blew me away. 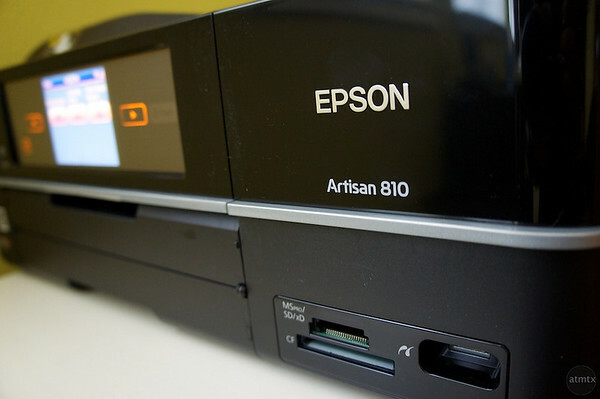 The Artisan 810, while being a solid and full featured consumer printer, is nowhere near the top of Epson’s printer line up. Epson has many more serious printers for photographers. It does however, use their Claria inks in 6 colors, black, cyan, magenta, yellow, light cyan, and light yellow. Each ink cartridge can be replaced separately. These inks are fade resistant and Epson claims a tested 98 year life under glass, 4 times longer than lab prints. Back in September last year, I wrote two blog posts about print quality tests I performed at some photo labs. In Printing Photographs: Costco vs. Bay Photo , I compared high-end Bay Photo’s output with Costco’s. A second followup, Round 2: Precision Camera’s Print Quality compared the output of the first two to a local Austin camera store. I used the same photos that I used in these lab tests and compared them to the Epson’s output. Epson’s photos were consistently better than the Costco prints. The color was more vibrant and matched my computer screen more accurately. I’ve only printed 4×6 prints so far but all the prints were also brighter and sharper than the lab prints. Comparing the Epson prints to Bay Photo and Precision camera was less conclusive. There were aspects of each I liked better. I still think Bay photo has the most accurate color, as justified by my unscientific comparison to my uncalibrated iMac monitor. Both the Epson and Precision prints were brighter than Bay’s. The lab prints seem to have a wider color gamut and the Epson has more contrast. Out of the three, I think the Epson will appeal most to consumer tastes. The photos were sharper, brighter, more colorful and contrasty. The Epson may sacrifice a bit of color and contrast accuracy for more “pop” in the photographs. Bay Photo’s prints were darker and might look better under ideal lighting but I think for every day use the Epson’s dynamic image may appeal more to consumers. I mentioned in my Precision Camera printer test that there was one gradient in the sky that gave both Bay Photo and Costco problems. The smooth blue to white transition abruptly changed causing a band across the sky. The Precision camera print handled the sky properly as well as the Epson. The office supply store had a limited selection of Epson photo papers. I purchased the mid-grade “Premium Photo Paper Glossy” and the tests above were done with this paper. The paper seemed a bit thicker and stiffer than Costco’s and Bay Photo’s and felt about the same thickness as the Precision print. The lab prints were on luster paper so the look is a bit different from the glossy — the Epson prints certainly had more shine. I generally do not like glossy prints since they pick up finger prints easily. Amazingly the glossy Epson prints do not show any finger prints at all. The printer came with a sample of their highest quality gloss paper, the “Ultra Premium Photo Paper Glossy”. I compared the output of both the mid-grade and high-grade glossy papers. The colors are very similar. Slight differences — the ultra premium seem to be a bit more saturated. The Ultra premium was also a bit more glossy and gave a bit more pop to the photograph over the mid-grade premium. Not a huge difference but a difference nevertheless. The Ultra was also noticeably thicker than the standard premium and the texture of the papers are different. The premium paper was a bit rougher, less smooth. Given these difference, you certainly get a higher quality feel with the Ultra Premium paper. If I were putting these prints in an album or picture frame, I think the mid-grade premium will be fine. The higher end’s paper advantages will not be visible. However, for prints that you will handle, put up on a board or pass around, I like the Ultra premium better. The paper will hold up better to handling, the smooth surface feels better and the photo finish seem to be more durable. Also, if I were custom framing a photograph, I would also opt for the higher quality paper just to get the maximum quality. Costco still has the cost advantage, although compared to the Epson and the two other labs, it came in last for quality. The quality was not terrible and some people may not even notice. Also I’m sure all photolab machines are different so your local Costco print may be better. It’s hard to judge the print cost from the Epson because of the ink factor. The mid-grade paper on sale came out to about 10 cents each. As most people know, the inks used in ink jet printers are quite expensive. The Epson color cartridges run about $12 each. I have no idea right now how many 4×6 can be printed, on average, from a full set of ink. If the ink cost about 20 – 30 cents per print, then the overall cost is in the ball park with the premium labs. There are two things about Epson’s print quality that I don’t like. For photographs, when printing the 4×6 borderless, the area that is cut off is a bit more on the Epson compare to the other prints. All of the prints cut off some of the area around the digital copy however, the Epson cut roughly another 1mm off each side. You can print with a border if you like, which will preserve the entire photo but with a white border. While I’m really thrilled, as you can tell, with the photo print quality. I’m disappointed with the plain paper text and graphic quality. The text is not as dark and sharp as my older HP printer. The text looks like a very dark gray and not black. Photos and graphics printed on plain paper also did not appear as sharp and crisp as the HP. I’ve tried both multipurpose paper as well as good 24lb ink jet paper and the results were the same. I’m wondering if printer head and ink technology Epson uses is optimized for photographs but is not as good for plain paper text. The HP seems to be the opposite. The text is black and sharp but the photo quality was only so so. I maybe pickier than the average person. My wife really did not notice a difference between the Epson and HP. My son did notice a ink darkness difference but did not see the resolution difference. Either way, they seem to be satisfied with the text print quality. For day-to-day text printing and output for school, the Epson will be fine. In business, if I wanted to make the highest quality text impression, I would not use this Epson. Since I don’t print much text anymore and my family is satisfied with the print quality, the printer works for us. I get a high quality photo printer and the family get a feature rich all-purpose printer. I’m really impressed with the photo print quality on this Epson Artisan 810. If you have an older Artisan 700, 710 or 800 and the current Artisan 725 and 835, the print quality should be the same as the Artisan 810. The printer has redefined what I though was possible from a consumer ink jet printer. I’ve been so impressed that I went out a bought a pack of Ultra premium 4×6 and Ultra Premium 8.5×11 papers. It also got me thinking, if these consumer grade printers are this good, what will an high-end wide format Epson printer do? It’s tempting me to get a printer capable of printing up to 13×19. But I will resist for now. I’m personally disappointed with the plain paper text quality but it prints at an acceptable level for casual use. Ultimately, the brilliant photo printing capability offsets my disappointment with the text. It is a trade-off I’m willing to make. For smaller prints up to 8×10, I plan to use the Epson for prints that I frame. It’s easy to get good results and the brightness and color makes it work well in a non-gallery setting, like my house. Thanks Jim. I can show you the output if you like. Not bad for a consumer printer.